Bill and Stew helping with groceries. Hunger is experienced every day in every community across the country. Volunteers play a critical role in ending hunger in the six towns we serve by giving their time and talent to support Loaves & Fishes. We welcome you to explore volunteer opportunities with Loaves & Fishes by attending a new volunteer information session. Please note we DO have volunteer opportunities for students, however, we have an age requirement of 18 in order to participate in volunteer activities when clients are present. Policy on Court-Ordered Community Service: Loaves & Fishes cannot accept volunteers who are seeking Court-Ordered Community Service. We apologize for any inconvenience. New Volunteer Information Sessions are held at our location, 234 Barnum Road, Devens. If you are interested in attending an upcoming session, please email: volunteer@loavesfishespantry.org to learn more. Ernest and Jennifer waiting for shoppers to finish so they can help them load bags into their cars. 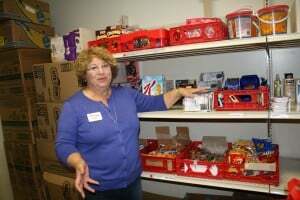 Loaves & Fishes Food Pantry depends entirely on volunteers! We always need help on days when we have open pantry sessions. Open sessions occur every Wednesday and Friday morning from 9:45 a.m.-12:30 p.m., the first and third Saturday of the month from 9:00 a.m.-11:00 a.m., and the second Tuesday evening of the month from 6:00 p.m.-8:00 p.m. 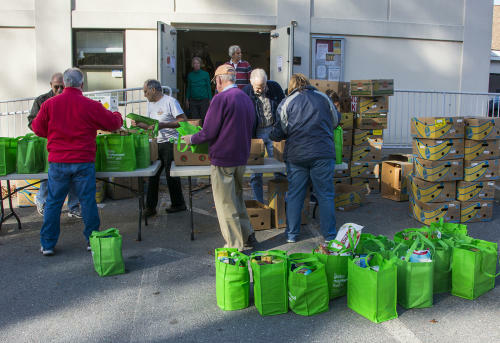 Volunteers can also help with pantry stocking sessions. Pantry stocking is done on Monday & Wednesday evenings, from 7:00 to 8:00 pm and on the Friday afternoon prior to a Saturday session, from 3:30 to 4:30 pm. Any questions or concerns, please contact the Pantry for further information at: 978-772-4627, x317 or email our Volunteer Coordinator at: volunteer@loavesfishespantry.org.